Abstract: There is a plethora of changes in VS 11 and the next .NET framework release that help improve developer productivity . In this article, we will focus on the Web Developer specific functions in the release that promise to make day to day developer life much easier. The Visual Studio 11 Beta along with the latest .NET framework 4.5 has been out for about two months now and there are a slew of really good features that aligns with Microsoft’s goal of ‘Developer Happiness and Productivity’. In this article we will focus on the Web Developer specific functions in the release that promise to make day to day developer life much easier. Every upgrade of Visual Studio usually results in a one-way upgrade of the .sln and .csproj files that results in breaking changes for older IDE. Hence if you were the team lead trying to play around with the latest IDE before you introduced it to your entire team, and if you upgraded your projects, you couldn’t check it in to source control because that would break the build for everyone else in the team. Not anymore! Visual Studio 11 upgrades to .csproj files are compatible with Visual Studio 2010 and you can round trip between Visual Studio 11 and Visual Studio 2010. In Visual Studio 11, you can invoke search from anywhere for example a global code search or a class search in Solution Explorer or a Control search in the Control Palette. Essentially all list/tree structures are now searchable. a. Code snippets: Large library of code snippets for most HTML tags possible. Code snippets come with the basic, mandatory values filled in with placeholders so you get an idea of the minimum values required for the new tag. b. Auto update of end-tags or begin tags when the other changes. So if we are changing a <div>…</div> to a <section> changing either the starting <div> or the ending </div> will update the other one. An opacity selector. If opacity value is < 1.0, then it automatically switches to argb mode. If it is 1.0, it goes back to #HEX mode. A color picker that you can use to actually pick any color off your monitor. The snippets are smart enough to put in vendor specific tags as and when required. The editor can identify CSS hierarchies and indent the markup accordingly. a. Go To Definition. Moves the cursor to the object or function definition, even if it is located in a different file. c. Bracket matching. Select an opening or closing brace to automatically highlight the corresponding closing or opening brace. d. Outlining. You can expand or collapse functions and code blocks to highlight the structure of code. e. Smart indenting. The editor automatically indents the script hierarchically, as it is being written. f. XML documentation comments. Comments added to code for objects or methods, are displayed by IntelliSense, when writing code referring to those objects or methods. a. MVC style object binding support in Web forms applications, simplifying the code and reducing repetitive development work. b. No need to switch to design view for smart tag based functions like assigning a data source to a GridView or updating a Template, smart tags are available in the source view itself. Shortcut of Ctrl + . (period) works too. c. Similar to smart tags, now event generation is also available in the source view. No need to switch to the design canvas. 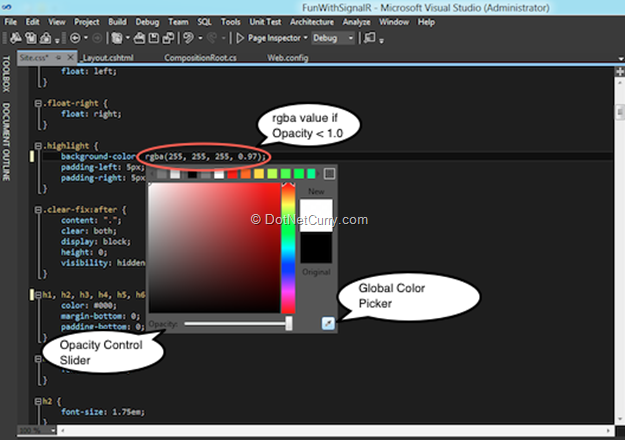 It’s much like the XAML editor. d. Renaming ASPX pages. More easily change the name of an ASPX page. 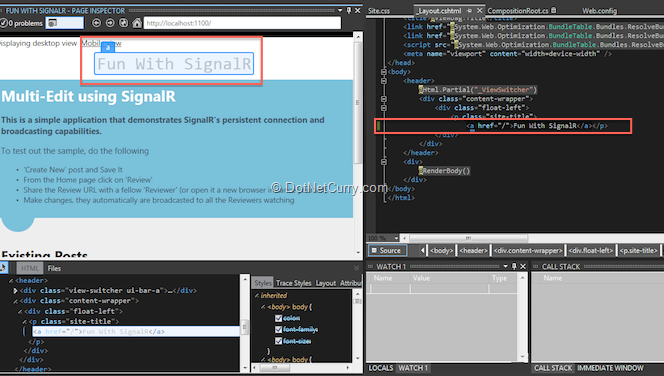 Visual Studio 11 Beta automatically updates all references. e. Extracting to a user control. Select and extract the required markup to create a new user control. Visual Studio 11 Beta updates the page to include all necessary tag prefixes and registrations, and includes the control in the correct place on the page. Re-use the control elsewhere on the site as required. It even respects any configurations in the web.config for the control. 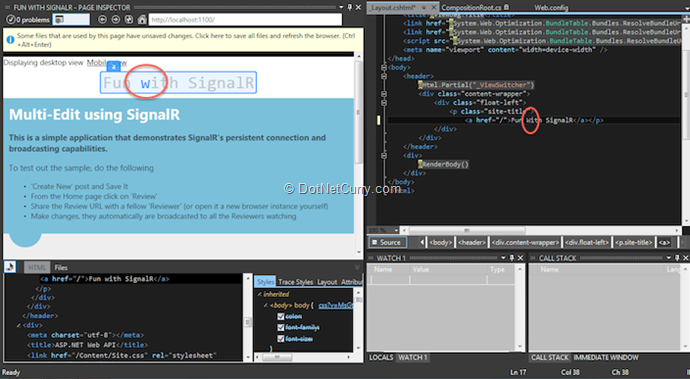 The page inspector is a browser window inside Visual Studio to render web applications as they are running on the server. Additionally it provides several useful features and developer tools that help debug markup and styling. c. Automatic style navigation: Just like code navigation, you can navigate to particular CSS element and page inspector will track the CSS and bring it up for you, making CSS changes super easy. d. Change detection and refresh. Page inspector detects markup changes that are made on the fly and a single keyboard shortcut (Ctrl+Alt+Enter) saves the changes and refreshes page inspector. The async and await keywords further simplify usage of the Task Parallel Library enabling users to develop Asynchronous services that help build more responsive services. Benefits of this can be fully expressed in an article of it’s own. A lightweight database engine that installs and starts quickly and provides full compatibility with both SQL Server and SQL Azure. This ensures that developers can develop, test, and debug sites on their development computers with confidence that the site will work as expected when deployed to a production web server using a SQL Server database. i. Activity annotations. You can add annotations to workflow activities to provide additional developer documentation. iii. Consistent syntax for workflow expressions. If you are using Visual C# to build workflows, you can now define expressions by using C# syntax. 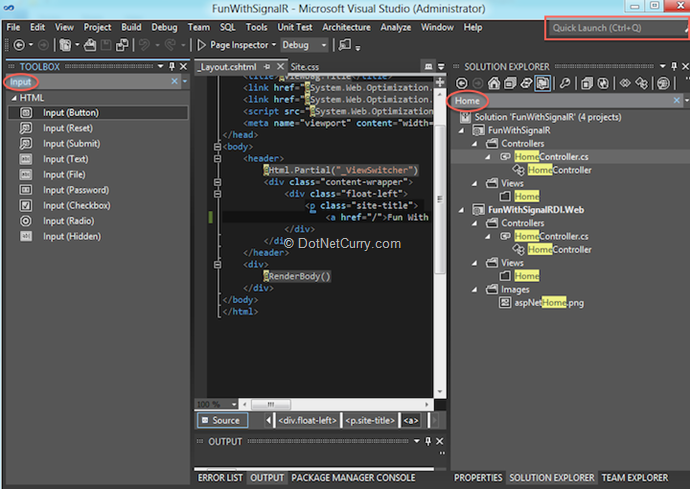 If you are using Visual Basic to build workflows, you can continue to use Visual Basic syntax in expressions. iv. Finite State Machine workflows. State machines can be used to define business processes rather easily. Apart for the Sequential workflow activities now developers can create Finite State Machine workflow to model workflows that match business requirements much more closely. i. Tree view. You can navigate large workflows more easily by viewing the structure. ii. Pan gestures. You can easily pan through the designer if the workflow does not fit on a single page. iii. Error identification. You can find and directly navigate to errors in the workflow designer from the error list. Overall there is a plethora of changes that help improve developer productivity in VS 11 and the next .NET framework release. Lookout as we pick each one apart in the future. @Greg Thanks, missed that one. Yes, it is a really useful functionality. @Anand Thanks, glad you liked it.